I guess the first officer covers one of the main bridge functions, like Spock did in ToS? Yes, Mission Ops, in the back, at the table. NO FOODSTUFFS, SOLIDS OR LIQUIDS, ARE ALLOWED ON THIS SHINY-NEW BRIDGE! You do some really beautiful work! Thank you! This was a joint venture but I appreciate the sentiment. Absolutely love this! 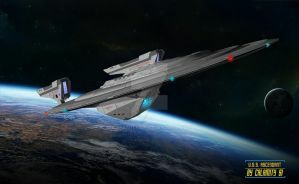 Very reminiscent of the USS Vengeance from Into Darkness -really works well in the Prime-Timeline. Love the holographics in the background too! Great job! Thanks! It was a joint venture and we're really happy with it.